In just a couple of days the Dutch will have a new head of state: the reign of King Willem-Alexander of the Netherlands starts on April 30th with his inauguration. (Dutch monarchs are not crowned!) After a 33 year reign, his mother Queen Beatrix stepped back. Not because she was tired of the position, but because she felt the country should be passed on to a next generation. My own generation, the king is only two years younger than I am, and that takes some getting used to. In the days leading up to this big event the Dutch get ever more exited. Orange coloured decorations are popping up everywhere. But not all the preparations were positive for cyclists. Amsterdam started removing parked bicycles a week before the event already. The new king Willem-Alexander of Orange and his wife Máxima cycling in New York on orange bicycles during a state visit in the NY400 celebrations in 2009. And let’s stay with this topic of cycling! As I already showed you on the day of the announcement, the Dutch Royals have a long cycle tradition. Just like their subjects, they use the bicycle for all sorts of every day reasons. That day I could only show you pictures, but you are used to seeing videos on this blog. So for today’s post, I prepared a video with moving images of most of the five generations of cycling Dutch royals. Only from Queen Wilhelmina, the first generation, I couldn’t find any filmed footage. Video of Willem-Alexander and the other Dutch Royals cycling. Wilhelmina had fallen in love with cycling on a holiday in Austria in 1897, and she quickly got herself her own bicycle. This was against the will of her mother, the originally German Queen Emma. 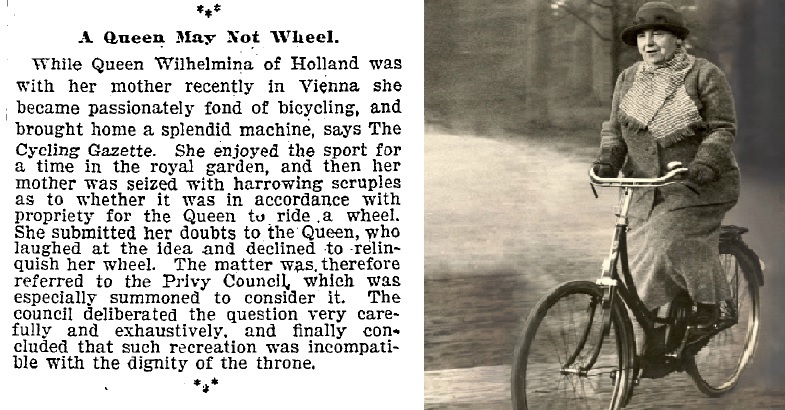 Just before Wilhelmina became Queen in 1898, Emma had forbidden the young Queen (she had just turned 18) to cycle. Wilhelmina was the only heir to the throne and Emma found the risk too high, that she would not be able to produce a new heir to the throne, in case of an accident. Wilhelmina challenged her mother by going to the Council of State, but they supported the decision, stating that “the matter of her Majesty’s life and death is too important for too many of her loyal subjects, to take the risk, how ever small it may seem”. The official reason given was: “Cycling is not dignified enough for a Queen”. Queen Wilhelmina obeyed the cycling ban until the early 1930s. Especially after her mother died in 1934, she was increasingly seen cycling with her daughter Juliana on public roads around the palace in The Hague. Left: article in the New York Times, December 12, 1897 and right, the cycling Queen in the 1930s. 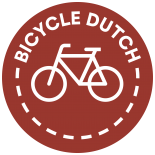 All generations of the Dutch Royals have since cycled and have also been filmed cycling. They cycled privately but also public visits by the queens, in their own country and abroad, included a cycle tour quite often. Especially Queen Juliana was exited every time she got to ride a bicycle on an official visit. Recently the current royal couple cycled on state visits in New York and Istanbul. Willem-Alexander’s originally Argentinian wife Máxima cycles with their children and she also cycled in ’s-Hertogenbosch. She visited a school to hand out certificates to children who passed their traffic-exams. We can only speculate if Willem-Alexander will continue to publicly cycle as a king. But I see absolutely no reason to give up cycling as the head of state of a cycling nation. It is also a good sign that his three daughters, including the new crown-princess Amalia, have been seen cycling on a number of occasions already. 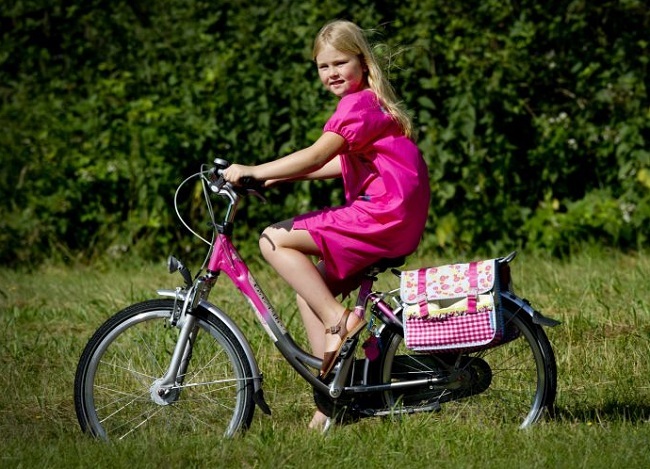 The future of the Dutch Royals on a bicycle seems secure! The new Dutch crown-princess Catharina-Amalia of the Netherlands. The first Princess of Orange is 9 years old. Orange coloured decorations are popping up everywhere. 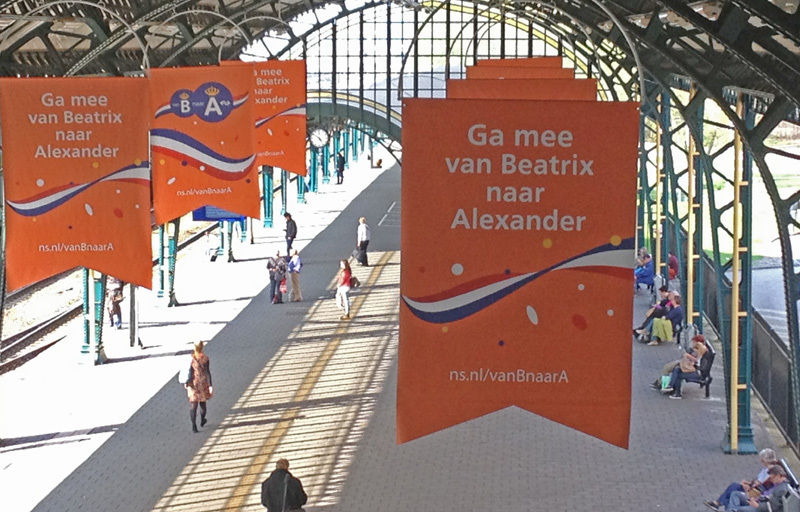 The Dutch Railways have banners urging travelers to come along “From B to A”, From Beatrix to Alexander, instead of the normal from A to B. Does the king get immunity from violating any mandatory helmet laws? He’s immune from violating mandatory helmet laws, yes. That holds for all zero of them. There are no helmet laws for cyclists here. Fast cyclist have them and now and then childeren, but that appears just recenty. And tourists. The Dutch in general, we feel save without. I wonder what would happen if the new king for whatever reason became not king anymore and then the current crown princess became the queen. That would be interesting to see a monarch that young, especially considering she would be 11 in a couple of weeks. A regent would be appointed to be acting king or queen until she were adult. Most likely candidate would be her mother, queen Maxima, but her uncle, prince Constalntijn, would be a possibility too. In fact we had that situation before, when Queen Emma was regent for her daughter queen Wilhelmina from 1890 to1898 (actually she had been instated as regent a few days before king Willem III’s death, because he was considered unfit to govern because of his medical condition). The abdicating Queen grew up in Canada near where I used to live, and her sister, Princess Margriet, was born here. Her Majesty was a student at Rockliffe Park Public School in Ottawa. An amusing story: Princess Beatrix was 7 1/2 years old when First Canadian Army liberated The Netherlands and the Dutch Royal Familty was able to leave Canada and return to The Netherlands. Having only known life in Canada until then, Princess Beatrix really missed… ice cream! Great story. Richard Tulloch, my old Raleigh Sprite is black, so it is fairly easy for this commoner to match the colour of her bicycle, at least in part. I do have flowery saddlebags like the little princesses, though. Bought them in Amsterdam. wow wow wow… i am really amazed. i had a massive grin for all of this 🙂 so inspiring and uplifting. all the best to the netherlands! We common folk may not have a selection of clothing that matches the colour of whatever bike we’re riding at the time, but we can all be inspired to do our best! Thanks for this, another heroine’s story to bring tears to my eyes by showing the indomitableness of the human spirit. Queen Wilhelmina, forbidden from experiencing the joy of cycling for over 30 years from when she was a young adult, makes up for it by taking it up again in her 40s and then spending the remainder of her life cycling and passing down that joy to her children. This story should be made into a book for young children if it hasn’t already. And I’m far from being a monarchist! I hope the Netherlands enjoys the inauguration day. Cheers! There’s a recent book by Pete Jordan about the history of Dutch cycling, in Amsterdam in particular (http://www.latimes.com/features/books/jacketcopy/la-ca-jc-pete-jordan-20130428,0,4963566.story), in which he quotes an anecdote about Queen Wilhelmina riding a bike in the woods around her home following her abdication in 1948. As the road was a bit slippery and she herself over 60 she kept to the middle of the road, blocking the road for a car coming up behind her. The driver didn’t recognize her and yelled: “Get out of the way, woman” which the former queen obligingly did. She later wrote in her diary that this had been quite a bizarre experience. This entry was posted on 25 April 2013 by Bicycle Dutch in Original posts and tagged history, Royal family.